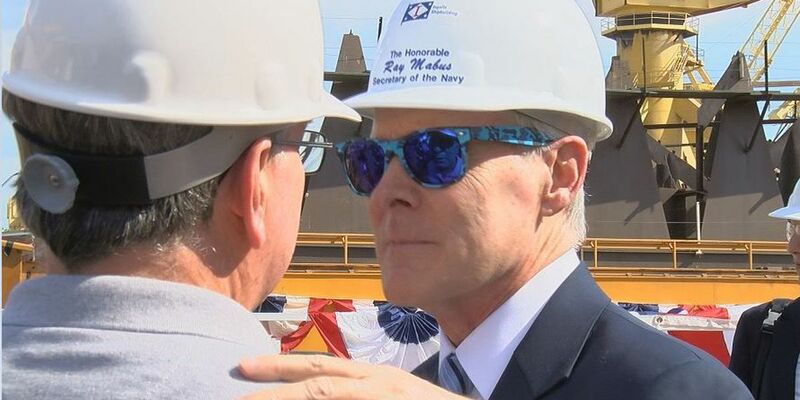 PASCAGOULA, MS (WLOX) - It was a farewell tour of Ingalls Shipbuilding for Secretary of the Navy Ray Mabus as he spoke to about 250 shipyard workers Friday afternoon. Mabus wanted to thank workers at Ingalls for giving sailors and marines the tools they need to do the work. The former governor of Mississippi says that since he began the job in 2009, the cost of every single ship in the Navy has been driven down. The destroyers built at Ingalls, according to Mabus, are $300 million cheaper - all because those who build them are simply doing it better and doing it smarter. "I've been in this job longer than anybody since World War I," Mabus said. "And what I am so proud of is that the decisions, the actions have substantially changed the Navy and Marine Corps, but they've also significantly strengthened the Navy and Marine Corps. Our Navy and Marine Corps is stronger than it's ever been." He offered three tips for the next Secretary of the Navy. "Number One: Keep building ships. Number two: Keep buying aircraft, because we bought 35 percent more aircraft than the seven years before. Number three: Treat your sailors and marines well. Make sure that we keep attracting the very best that America has." Mabus would not mention any specific direction he will go after he leaves his post except to "look for work."